Updated: I’ve written a follow-up on research ethics to make up for some problems in this post. Yes, that title does in fact include the phrase “pureed bee heads”. While on vacation, I was doing some reading on basic stuff related to neonicotinoids, my favorite pesticide class1. One paper that came up was a 2001 toxicity study done by researchers at Bayer AG on the effects of imidacloprid on honey bees. The results are not terribly surprising to anyone who knows anything about the (acute) effects of neonicotinoids on bees (neonics kill bees at high doses, make them behave funny at lower doses). Even though the results are unsurprising, the methods were interesting to me. Partly this is because I just don’t know that much about the field. But bonus for you is that you get to learn about interesting (but gruesome!) methods for find stuff out. When I was reading that book on pesticide metabolism, there were a lot of passing methods to interesting methods. One method involved taking rabbit or other animal skin and spreading it thin to test skin absorption of a pesticide. A bit “ewww”, right? But, neat that they can figure things out using it, right? In this study2, two of the things they wanted to study were if proteins in the brain bound to imidacloprid or chemicals that are by-products of organism reactions with imidacloprid (called metabolites) and if neurons in the presence of those chemicals reacted differently to electrical signals. To study this, they cut off bee heads and pureed them. For biochemical studies, worker honeybees were carefully collected from hive combs (collection site: Burscheid, Germany) and directly frozen using dry ice. Bee heads were then separated from other body parts by vigorous shaking and recovered by sieving. The heads were then frozen at -40°C (usually not longer than 6 weeks) until use. Bee heads weighing 10g were homogenized in 200 ml ice-cold 0.1 M [molar] potassium phosphate buffer, pH 7.4 containing 95mM sucrose using a motor-driven Ultra Turrax blender. The homogenate was then centrifuged for 10 min at 1200*g* and the resulting supernatant was filtered through five layers of cheesecloth and then used without prior purification. In short, they froze bees, separated their heads by shaking and tossing thru (probably) a small mesh, then later pureed them using a fancy science blender device and mixed it with sugar solution and other chemicals. Then they did some tests to see if anything in there reacted with imidacloprid or with common metabolites of it. In a related experiment they separated neurons out of those bee heads and ran electrical currents thru them when they were floating in solutions containing different amounts of chemicals that might interfere with electrical activity. This is gruesome. While doing more population based studies is useful — for example, feed bees the chemicals of interest and see what happens over time — it’s also necessary to find out exactly what is going on at the physical level rather than just correlations. In this case, they are trying to see if and how imidacloprid affects bees in the brain by directly extracting the relevant parts and doing experiments on them. One result they got which would be much harder to tease out using what I would think as an obvious way to test toxicity (feed the chemical to bees, see which ones die), is that there are different forms of the same brain receptors that are reacting to imidacloprid and to different degrees. To do that, they had to puree bee heads. No doubt these are obvious methods to someone in the field, but to me they are gruesome (but neat!) science methods3. Gruesome Science Methods might become a series. We’ll see. Pesticide studies definitely lend themselves to it. Months ago I signed one of those Whitehouse petitions. The petition asked the President to require that science articles that were paid for with government money be made freely available over the internet. In short, we paid for it and should be able to read it. Surprisingly, the administration actually responded! I even got an email. Huzzah for participatory democracy! But, sadly, the policy is not as good as I’d like. The policy only directs the larger federal funding agencies (more than $100 million budget) to create policies that would require free online access a full year after publication. Some scientists find out something awesome (or really useful or maybe not terribly interesting to me but still useful to other scientists). Fairly often their work was funded by my — and your if you live in the United States — tax dollars. Some journal editor secretly decides if it is going to get reviewed and then a few reviewers and the editor decided if it will be published at all. A select few people (called journalists) get access to it early so they can write news stories about it. (Optional) A university press department puts out PR fluff about how absolutely fabulous the research is1. I read a news story about it. Sometimes the story isn’t written very well so I don’t understand what the research was about or I just want to know more about it or (sadly) it sounds like it’s being over-hyped and I don’t believe the reporter. I try to go find the paper (if the reporter has given me enough clues to find it as science news stories even on the internet rarely link to them directly). Most of the time I don’t have access. Look at all those gatekeepers! I don’t have a lot to say about those pre-publication gatekeepers (the editors and reviewers) but certainly scientists like Eisen do. This new policy is really about those last few steps. Why don’t I have access to it when it’s news? Why are some citizens (journalists) specially privileged to tell me about what I paid for? The year embargo2 means most people will still only get their science news and understanding from possibly misleading news stories3. Not everyone is going to go read the science behind the story but I think science understanding and news reporting would improve if more people gave it a try. Now, I can directly ask the researchers for a copy of the paper. Or I can go to twitter using a #ICanHazPDF tag and hope someone helps me out (so far 100% success with this). But I shouldn’t have to. I’m only getting used to this side-channel to journal access (and it’s not clear it’s legal). I still feel like I’m being intrusive when I do. Is a high school student newly enthusiastic about science and wondering what a real science paper looks like going to know how to do this or feel confident enough? Is a mom who read a scary news story about autism? She shouldn’t have to depend on a gatekeeper just to find out the media overhyped a story, yet again. Whine, whine, not good enough, it’s better than nothing! No, it’s just not good enough. We paid for all this research. We should be able to read it. A year later is never for a non-scientist with a fleeting desire to read more about a piece of science news they just read. Hopefully the recently introduced FASTR legislation will be an improvement on this weaksauce policy. Write your Congress critters. You can’t switch off the lies and exaggeration. But don’t worry about them. When I saw the exaggerated pollinator-decline claim attributed to me in The Guardian I did not seek to correct it, because the correct information, with references, will go into a forthcoming parliamentary-committee report. Unlike stories in the press, that report will definitely be read by officials who advise the politicians who, for the United Kingdom at least, make the final decision. And because of such reports, and a recent risk assessment from the European Food Safety Authority, we can be fairly sure that the decision on whether to restrict neonicotinoid use in Europe will not be made on the basis of avoiding 20% yield losses in crops, or saving the world’s bees from extinction. My reaction? Your ivory tower is showing. Let’s assume the politicians listen to your science and not the public. Likely they won’t outright ban all neonicotinoids because there are clearly some reasonably safe uses of them. Let’s next assume a majority of citizens take the Guardian’s fear-mongering exaggerations at face value (and various activist groups continue to exploit those fears). To the public, it appears they have just been disenfranchised because they don’t understand why neonicotinoids aren’t banned. After all, the media is telling them that “the scientists” think neonics are causing huge bee declines! Why aren’t the politicians listening? Let’s instead assume various politicians listen to different lobbying groups, including some scientists and their reports. Some lobbying groups are arguing that banning or restricting neonicotinoid pesticide use will cause huge crop yield declines. Others are arguing that neonics will starve us all by killing the pollinators. Some compromise will probably be reached, but it’s not going to use scientific evidence as much as you would want. Public opinion and knowledge matter. Consider climate change. No one would say it doesn’t matter that the media (depending on outlet) either exaggerates or denies climate change. It does matter because it shapes public opinion which in turn shapes what is politically possible. If you want policy made based on scientific evidence, then you’d better step out of your ivory tower. Thanks to bug_girl and cotesia1 for retweeting this link to me today. Without pesticides1, farmers risk not growing enough to recoup their costs or growing crops that are too blemished to sell at market2. But by using pesticides, farmers take on other risks: many are hazardous to those applying them, they can kill beneficial “non-target” bugs or plants3, runoff can harm ecosystems4 and long-term over-use of pesticides can make convenient and safe methods of control less effective. So how do farmers balance these competing risks? One method is to predict whether or when a pest will be a problem. Farmers already do this for many crops (and various practices under the name “integrated pest management” usually require trying to predict pressure before using pesticides). But several common ways farmers control pests in crops like corn require up-front decisions because the pesticide is in the plant. This post was intended to jot down a sci-fi idea I’ve had stewing with no story to go with it. It turns out that idea isn’t as science fiction as I thought! How do farmers predict pests? If a field is not going to have enough pest activity to cause economic losses, there’s usually no reason to risk using a pesticide. But a farmer is going to want to be sure before making that decision. As an example, strawberries are often affected by molds that (as you can imagine) make them unsellable. Farmers usually control this by applying fungicides (pesticides that kill fungi usually yeasts and molds) repeatedly during the growing season. It’s a tricky balance. Apply too often and a farmer is wasting money. Don’t apply at the right time and she might lose a lot of berries (also, most shouldn’t be applied too close to harvest). Kevin Folta posted an example in Florida of using prediction to decrease application of fungicides. The mold is only likely to cause problems under certain environmental conditions, so they’ve built a network that keeps track of weather and other data and predicts when the fungicides are actually needed. The result is less pesticide being applied — good for workers, the environment and consumers. In the case of crops like corn5, weather isn’t necessarily how they decide whether to use a pesticide. Western Corn Rootworm (Diabrotica virgifera virgifera) is one of the most economically important pests on corn crops in the United States and Europe. This insect (like many others) goes through several phases of life. It starts in the ground as an egg laid the previous summer which hatches in a larval form the following spring or early summer, feeding on roots of young corn plants (hence the name). It becomes an adult after it pupates in late summer at which point it mates and the females lay eggs. The adult beetles are usually not very damaging to corn crops. The larvae however feed on the roots. Smaller amounts of damage make it hard for the corn to take up nutrients and decreases yield. Greater amounts of root damage and the corn plant might fall over (or “lodge”) — and yields no corn at all. For most corn growers, they need a certain amount of yield to be economically viable so some pests are tolerable, but above a certain amount and large swaths of the field will be damaged to the point of economic loss. But the lifecycle of corn rootworms allows a farmer to predict when pest pressure will be high! Integrated pest management (IPM) practices recommend capturing the adult beetles the previous season to estimate the likely numbers of larvae the next season6. Currently, the most popular way to control these rootworms are transgenic Bt varieties. There are several types of Bt toxins (called “Cry” proteins) that affect rootworms and different varieties of corn have genetic traits to express one or more of them. Under current EPA requirements, a farmer has to plant at least part of his field in non-Bt corn. The part of the field planted in non-Bt corn is called a refuge. The idea is that if any larvae survive eating the Bt toxins (and maybe have the ability to survive those toxins) they will breed with ones that lived off the non-Bt corn in the refuge. Hopefully this interbreeding makes sure that the pest insects as a group don’t have resistance. But there’s growing evidence that Bt resistance is developing7 and also that refuge compliance is lower than expected8. Moreover, some farmers are choosing to plant Bt varieties every season, regardless of whether or not they are likely to have a lot of rootworms that season8! The ag scientists are working on better ways to manage Bt crops including the idea of “refuge in a bag” which intermixes a percentage of non-Bt seed with Bt seed. The hope is farmers will find it easier to comply with refuge requirements (though it’s not clear how well it will hold off resistance — I have a post coming up on this). But it still doesn’t fix the problem of using a control method (in this case, Bt toxins created by the plant) when it’s not needed. Farmers rightly see this as a form of low cost insurance since if they chose not to use it and don’t really need it, it doesn’t cost much. Triggered Expression: Science Fiction … or Not? I had an idea a long time ago for a science fiction story that we could make seeds that have multiple useful traits. In the story idea (I never came up with a decent plot) a farmer would be able to “dial-up” his desired seed traits for the season. Punch some buttons and sometime later she has seed ready for planting, customized to her field conditions. Awesome, right? Of course, as I learned more about how seed breeding works, I realized that any particular combination of traits requires someone to have bred them into that seed at least the year before! Moreover, any one seed might require a complicated set of different parents9. So my story idea just wouldn’t work. Further, at least one of the traits I was imagining farmers “dialing up” were pest control ones like Bt toxins. Since Bt is still a pesticide, ideally farmers wouldn’t have to use it every year if there aren’t enough pests to bother, so obviously it shouldn’t be in the seed a farmer dials-up every year. Curses! There’s just no way to rescue this science fiction idea for increased farmer control of seed traits, is there? The other day I realized there was an even cooler sci-fi idea (and for about five minutes I thought I was thinking of something new): what if a farmer bought seed with all the traits she might want to use but then used some harmless chemical to trigger the trait working? For Bt trait, the plants would always have the genes for Bt but they would only produce the toxins if triggered by a signal. If we could figure out different signals for different traits, a farmer could plant seeds with all kinds of traits, but decide later when to use them. Science fiction idea rescued! But this idea isn’t as science fiction as I thought: about five minutes after I mused about this on twitter, I was pointed to some research on using plants as chemical signals to detect chemical warfare attacks. The idea is we could grow genetically engineered plants around a city or other sensitive area that would react to common chemical warfare agents and change color or appearance as a warning. This seems awfully expensive as a chemical warfare defense method, but in crop plants it seems like it might be worth it. Give farmers the insurance that they can use a particular method of control, but allow them to make the decision very late. Unsurprisingly there’s already research on this idea10 but it’s no where near commercialization. There’s a short post on science fiction ideas in agriculture that aren’t as sci-fi as I thought. The future is always coming sooner than I expect. I tweeted that sometime on the last day of the conference after realizing that I was socializing and talking about Awesome Stuff (not even necessarily all Science!) with so many people. And I was happy. Sure, I freaked out a bit, blathered at times and no doubt annoyed sometimes, but socializing wasn’t as hard as it usually is. Everyone was friendly, even the people I didn’t know from online. Meeting people I’ve interacted with online — some of them I feel like we were pretty much friends already — was amazing. Plus, there were people I’d sort of been aware of but not really following who once we’d had some conversations I really like them and now hope I can keep in touch a bit. But let’s talk about some themes that I want to think about more. The most important session for me, as someone trying to write better, was the “explainer” session moderated by Ed Yong and Mark Henderson (both of which did not run away when I talked to them). “Explanatory journalism” (hey, that’s kind of like jargon!) is a form of writing that is focused on providing fairly detailed, accurate information about a subject in a way that is engaging. It’s not a “dumping of facts” but rather giving readers a way to better understand a tiny bit more of the universe. It can be used to make better sense of a breaking news story, to provide background for an ongoing problem people are worried about or just for fun. Most of Ed Yong’s blog posts now strike me as being basically explanatory journalism. Most of his posts are just about showing you something awesome about the world. A main point I got from the session on “BS” is that a very effective (and more fun!) way of responding to BS is to instead explain how something related to the BS topic and how cool it is. For me, this would mean that instead of trying to debunk the latest viral anti-GMO message, I might go dig into some basic biology around whatever real (cool!) science (or science history) that relates to the BS. During the recent kerfluffle about viral genes in GMOs being dangerous (they’re not), a friend actually emailed me privately to mention his thoughts on it. He talked about how he had Arabadopsis thalliana seeds on his desk that he’d engineered in an undergraduate class to express some trait. He hypothesized that it likely contains the sequence that caused all the concern. But he didn’t actually know because it’s so mundane and common that he’d never looked into it. A minor paper of middling apparent scientific importance was spun into a headlines about toxins in our food. That paper was studying something that is used everyday in undergraduate biology classes. What a great opportunity to talk about the awesome stuff that even undergraduates are able to do! A good explainer on this would talk about what kinds of things the “scary ORF” are used for and describe how undergraduates use it to learn about genetics. Right now any kind of genetic tweaking is mystifying and scary to many. But if people had a better idea of what is possible and how it works, maybe those scary stories would have a lot more angry comments about crappy science reporting. Short version: don’t fight BS directly, sucker punch it from behind with entertaining explanations of how awesome the universe is. I was going to write a section about how this affected me personally — in my ability to interact with people, have conversations, get over social anxieties. Suffice to say it helped. Apologies to everyone at the conference — but you were my unwitting therapists by being so welcoming and enthusiastic. For one aspect of the conference, a longer form that I basically agree with is here. Sadly, I don’t think I met the author! But most of all, I’ve got ideas about more things to write about and a better idea how to organize. I’m still not sure what I’m doing with this blog other than putting stuff up on the internet (and hoping I don’t make too many mistakes). I don’t really know where I’m going but I can see that I can get better at it and maybe help a few more people get fascinated by something. 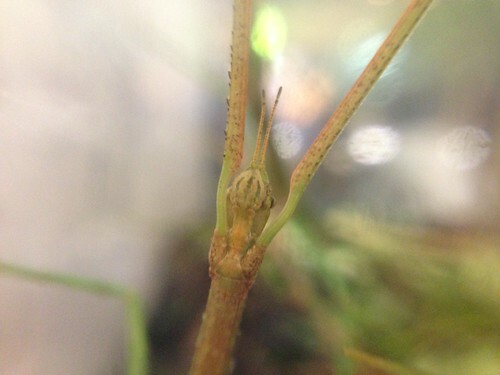 And now, a picture of a walking stick bug that I took at the Nature Research Center that is part of Raleigh’s Museum of Natural Sciences. For opening night we got to wander around, look at the exhibits and learn about (and participate in) citizen science projects. I got my face scraped for mites. On the second floor, I found this walking stick in a terrarium after I’d talked to the folks with the Your Wild Life project who are studying why a Japanese camel cricket is more often found in our homes and basements than the expected native one. 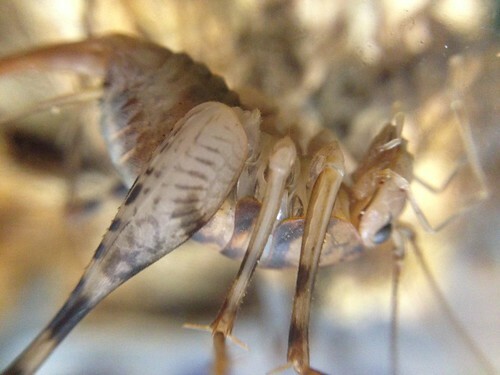 Okay, you can have pictures of a cricket and the walking stick!